Users who’ve recently upgraded their PC to Windows 8 using the Windows Upgrade Assistant and perhaps selected the Install now option or cancelled the download, might be looking for a way to download Windows 8 setup as an ISO. That’s because if you choose Install now, then the upgrade assistant program no more saves the ISO file and straight away continues with the installation process. Certainly, having Windows ISO has its own benefits like you can burn the ISO to a DVD or create a bootable drive to install Windows 8 later on multiple PC’s or just in case you perform a system format. 1. Open the email inbox that you used to buy your Windows 8 copy. Look for the Order receipt email, open it and click the ‘here’ link as shown in image below. 2. Save the ‘Windows 8 Setup’ file and run it. 3. 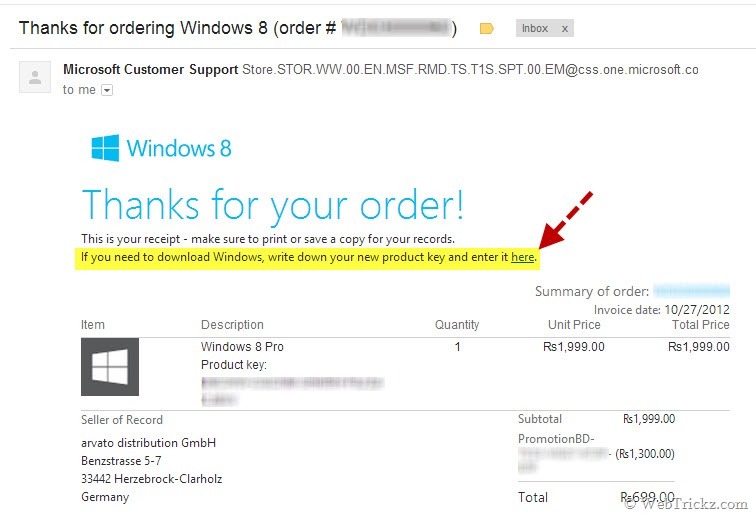 Enter the genuine Windows 8 product key received from Microsoft. Click Next. 4. Click Next when you see below window. Downloading will begin now and might take some time depending on your Internet connection (setup is over 2GB in size). Note – You can Pause the downloading anytime and close the Windows 8 setup. To resume it again, just run the ‘Download Windows’ shortcut created on your desktop. 5. Once download is complete, you’ll be presented 3 Installation options as shown. Select the middle option ‘Install by creating media’ and click Next. 6. Next, choose the ISO file option, click Save and specify a location on your computer. Wait until the Windows 8 ISO is saved. Finish!